What On Earth is a 5 reel, 9 payline multiple coin video slot that is sure to appeal to a wide range of players through Wild and Scatter features and multiple bonus games (3). What On Earth is a highly entertaining, Sci Fi themed game with the most innovative and rewarding bonus games yet to be seen on the Internet. This new game from Microgaming has released in May 2005 with another slot game - Off The Hook 3 reel, 1 payline slot game with 2x - 4x Wild symbol and large jackpot. 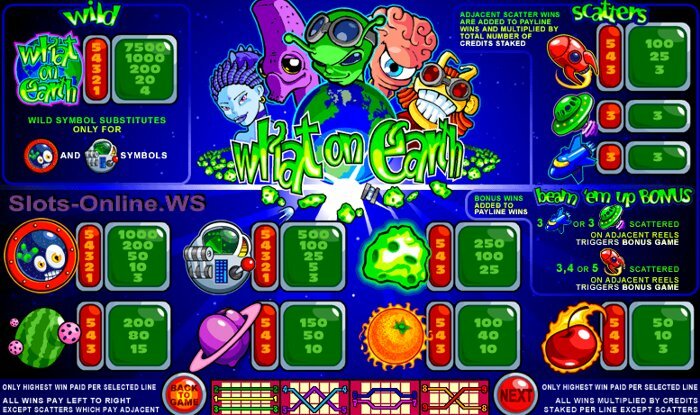 With a maximum jackpot of 37,500 coins to be won, and a whole range of new scatters, wild and special Beam Me Up, Contest and Destination bonuses, this one is going to be a winner, delivering more reward opportunities than ever before to the player, and a whole lot of entertaining fun in locating the most valuable Earthlings to beam up. Coin sizes are ranged from just 0.01 to 1.00, bet 1 to 5 coins per each of the 9 paylines. A new galaxy of winnings has just been discovered! 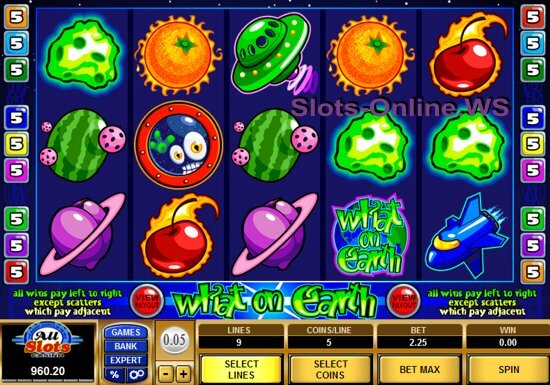 The fun outer space theme is presented through high quality graphics featuring everything: Flying Saucers, galactic monsters and whirling asteroids. The amusing characters in the bonuses will have players beaming up rewards from between 3x to 400x multipliers. This is surely one of the most thrilling and imaginative new games currently available. The game has multiple level bonus games where the player can enter into 1 of 2 additional bonus games from the primary bonus game. This gives the player a total of 3 bonus games to play. It's a more American style video slots with adjacent scatter triggers. The Bonus feature can be triggered in 3 different ways by 3 different scatter symbols in the base game and if that isn’t enough to excite the players, all bonus wins are credit values and Multipliers too. The Contest Bonus Screen gives the player a whole lot of entertaining fun in chasing the highest value Earthlings to beam up. On the Destination Bonus Selection Screen can select to visit New York, London, Cairo or Tokyo and then reach the Destination Bonus Screen where players need to lock-on and beam up the main themed character for each city for up to 400x bonus. What On Earth slot game can definitely take your winning to the new heights. Strike It Lucky (review) - Flash-based online casino - get €/£/$20 free. Dragon Born - Bonus Feature 9 Line Slot from Big Time Gaming. Jackpotz - Bonus Feature 9 Line Slot from Core Gaming. Happy Days - Bonus Feature 9 Line Slot from Blueprint Gaming. Cosmic Quest 2 - Bonus Feature 20 Line Slot Machine. 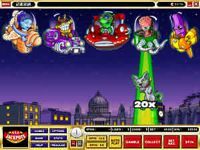 Cosmic Quest 1 - Free Spins 20 Line Slot Machine. 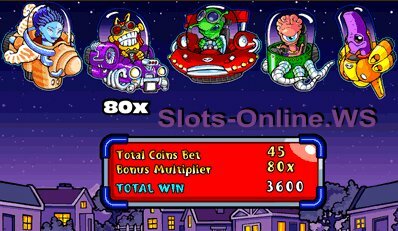 Monster Meteors - Free Spins 25 Line Slot Machine. List Of Top 20 Online Casino Slots Winners For March 2009. I have composed the top 20 online slots and progressive slot machine winners list for..
Big Bonus Space Beams And Fishing Jackpots Feature In Latest Microgaming's Slot Games. The flagship game in the current collection of latest..